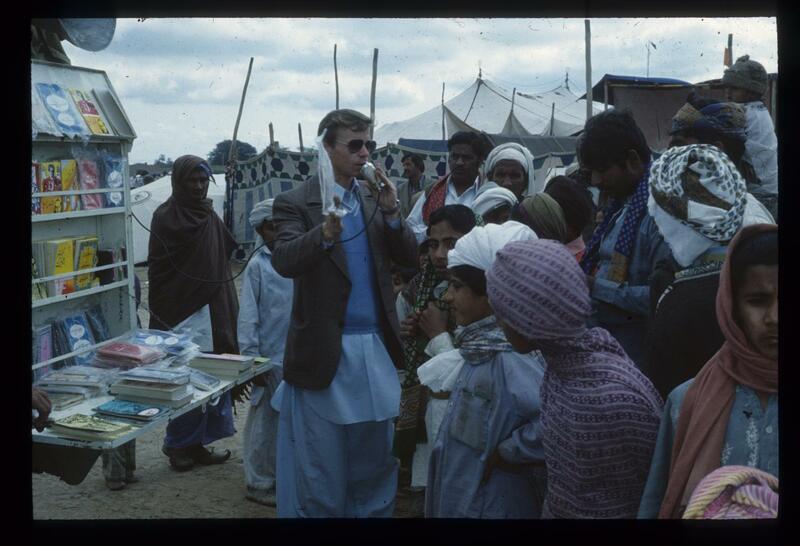 In 1968 my wife Carol and I went to Pakistan and spent the next twenty-three years in an ancient city with a current population of over four hundred thousand people. Although there is no church building in this large metropolis, there are some Jesus followers. We had two sons in Pakistan, one of whom was born very near to where Osama bin Laden was killed. We started a Bible correspondence school, still going under Pakistani national leadership. Through this media, hundreds of Muslims throughout the country took courses that were designed to progressively take students to the next level. The goal was to help them first see their need of salvation through Christ and then grow in him. On a national scale, some wrote and said they had come to faith by studying the Bible. Locally, others believed, and with a few of them we had fellowship on a regular basis. Every day we studied the Word, spent time in prayer on our knees, and memorized one Scripture verse in Urdu. On November 20th, 1979, our family experienced an attack that brings some perspective on the tenth anniversary of 9-11. That year has been called the “Watershed of fundamentalist Islam”: Islamic militants in Iran took over the United States Embassy in Tehran and held American hostages for 444 days. The Soviet Union moved into Kabul with their military might and occupied Afghanistan. From then on Islamism accelerated across the Muslim world. Listening to the BBC on the morning of November 20th, we heard that the Grand Mosque in Mecca had been seized by unknown gunmen. It was during the annual pilgrimage as a million Muslims milled around the black-robed Ka’aba. Not particularly concerned, I drove down town for some early-morning shopping, and was greeted by those who recognized my green Land Rover. But shortly after returning home, a friend came by to warn us of angry processions in the city. Ayatollah Khomeini’s announcement that this was the work of Americans and Jews had been taken at face value by some in our city. Standing inside the door we listened as our tough Land Rovers were assaulted and the doors of our house were pounded with bricks. Soon the attackers broke in on the other side of the duplex and continued their rampage inside the house. We knew they would soon gain access to the entire building and concluded we might as well go out and face them. The door between the apartments was stuck, and when I forced it open, the attackers fled. We followed them out, but rounding the corner saw there were about two hundred college students, some of whom I knew personally. Realizing we were no match against so many, I took a different approach. Holding my arms in the air, I said in Urdu: “I’m Canadian.” They responded that there was no difference, set our vehicles on fire, and continued to destroy whatever they could. As black smoke billowed upward, a kind neighbor called the cops. Police came in with sirens blaring, and since Martial Law was in effect, so did military personnel. A few students were arrested and put in jail. Four hundred miles away in Islamabad, the American Embassy was burned to the ground, and two lives were lost. Three days later, the truth came out that seizure of the Grand Mosque in Mecca had been carried out by over three hundred radicals, mostly from Saudi Arabia. They were followers of Juhayman who claimed to be the “Mahdi” (Muslim Messiah). With the help of French security forces the rebels were eventually flushed out and those who survived the bloody battle were promptly executed. When we forgave the attackers, as Christ taught us to do, some neighbors embraced me and said: “Mr. Larson, now we understand the difference: You have forgiven your enemies but we tend not to forgive those who harm us.” It took years for our family to get over this incident, because every time we heard a joyous wedding party, it reminded us of the attack. Nevertheless, after that experience we had a greater burden for Muslims, and saw more fruit. Our experience over thirty years ago was nothing compared to the loss of nearly three thousand men, women and children on 9-11, but it does reflect how God brings good out of evil: First, over the last decade, more students are studying Islam and learning about Muslims. People come from great distances to take courses offered by the Zwemer Center. Second, despite the risk and danger in some Muslim contexts, a surprising number are signing up for full-time service. Not long ago I counted thirty Islamic countries where within the last fifteen years our students are serving. Third, along with the rise in radical Islam there has been greater receptivity to the gospel. There is ample evidence to show that more Muslims are turning to Christ today than ever before in history. Finally, Muslims are increasingly condemning radical Islam. If Christians will reach out to Muslims with love, understanding and forgiveness, there will be a much greater harvest among them over the next ten years.